Because I'm sooooooo over winter. Yes, please! That sounds awesome! It is cold again here this today, seed shopp8ing would be fun! I am ahead of you on the seeds, I checked at the hardware in town where they have bulk seeds and they haven't come in yet. I did notice that they were well stocked on snow shovels if you still need one. The Great Scot laughs when I suggest retiring to the Sahara (or even the Mojave) but I'm really quite serious. Looking for garden seeds sounds FABULOUS! Count me in. Please ,yes I daydream lately about my garden ~ I know there will be signs there once this snow melts. While I very much dislike the slush and mud on the streets here right now because the snow has melted, I'm happy snow is gone and spring is around the corner. Just hoping this counts as March "coming in like a lion." So cold here it hurt to breath this morning! Winter IS getting old, but that picture looks like so much fun! I planted last year and critters were totally taking free reign. It'll be interesting to see if anything grows back (crossing fingers). 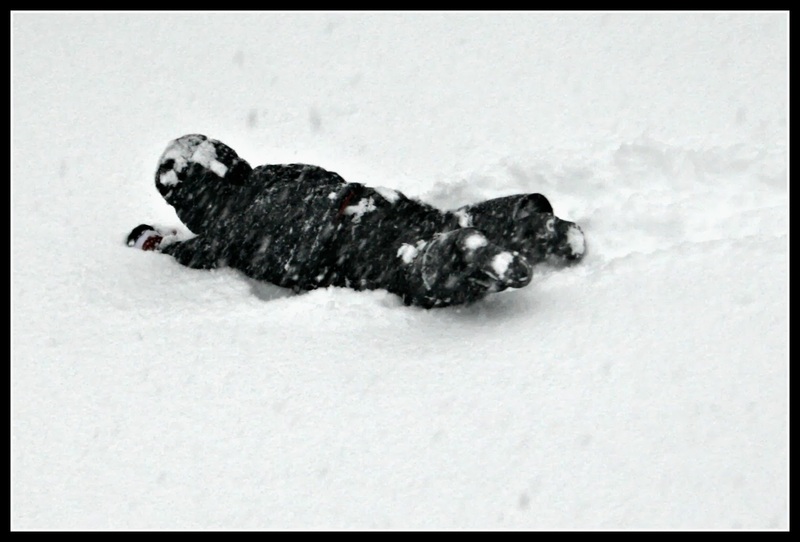 Kids and snow: They just go together. Great photo! Hi Lisa, I think we are ALL anxious to see some spring NOW. Even though I like winter, I am READY for spring and some spring flowers--and some WARMER TEMPS. Courage, encore quelques semaines et ce superbe plongeon se fera dans l'herbe fraiche. Amitiés. I'll go! But seriously, we have icicles hanging from the limbs and eaves today. What's with that? Not common for our area for sure. Too funny! But I'm with you. Welcome, March! We will have to revisit this photo on July and see how long ago it feels. I'll go! We have been getting seed catalogs in the mail. I'm ready to dig in the dirt. I am over winter too! Seems to be so cold. Seeing your picture i am frozen. I'm daydreaming of spring and being able to see green grass and my garden growing. I'm over winter, too! Yikes. Looking at that picture makes me cold!